Have you read Princess in the Spotlight yet? If not, you better go do that before you read this review because I’m going to break it wide open with all sorts of SPOILERS with my review of book three in the Princess Diaries series, Princess in Love. OK, you’ve been warned. Here we go…. If you already read Princess in the Spotlight you know that Mia’s mom and Mr. G got married and Mia is going to be a big sister. (wow, felt good finally letting that all out) You also know that Mia’s secret admirer is….drum roll please….Kenny! Oh. Yep, Mia has a boyfriend and he’s her lab partner Kenny. 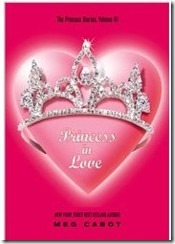 That must be why the book is called Princess in Love, because Mia is in love with Kenny. Or is she? We all know that Mia has had a crush on someone else for some time now. While she spends a lot of time thinking about this other guy, she also has plenty of other things to worry about in this book. Really important things like finals and Christmas shopping and her trip to Genovia where she will be officially presented to the Genovian people as Her Royal Highness Princess Amelia Mignonette Grimaldi Thermopolis Renaldo. Oh, and let’s not forget about French kissing. Want to know what my rating is? Like you even have to ask! I give Princess in Love a Shrimp Coma Mrs. B all the way! *or as I discovered in 1984, you’ve had a California Cooler or two.